By beating a number of larger and better funded opponents over a period of weeks, the La Perouse Rugby League Football Club made it to the Grand Final, the last and deciding game which would crown the Rugby League champion for the southern suburban region of Sydney. Australian Rules football, such as the kind played in the Australian Football League (AFL), involves kicking the football through a set of different goals to score points. Field position is crucial to move the ball to just the right place on the field so that it may be kicked through the goal posts, and these AFL games tend to be high scoring ones. Rugby League football, the type seen here, is much more similar to American football, which is called "gridiron" in Australia. With National Rugby League (NRL) football, something similar to a touchdown (called a "try") must be scored by placing the football inside the other team's goal. Each team has 6 chances, similar to downs, to move the ball down the field and score a try. If they aren't going to make it on the 6th time running with the ball, they usually punt it away to the other team, hoping to give them poor field position. If a try is scored, then a field goal is attempted. A successful try is worth 4 points, and a field goal is worth 2. The game consists of two halves of 40 minutes each. In Rugby League football, the ball may not be passed forward and must be passed to the side or back to another player. In addition, play is continuous, usually not even stopping for player injuries. If the forward momentum of the ball is stopped or the player with the ball is tackled, play starts over immediately with the player last controlling the ball rolling it back to his teammate behind him. 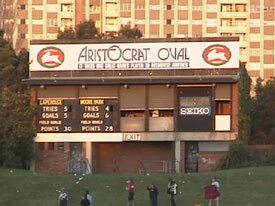 La Perouse used a combination of skill, stamina, and excellent timing to defeat Moore Park and win the 2001 Grand Final. A try by Bunda (Robert Simms) evened the game with only minutes to play, and the winning kick came from Pumpkin, one of the team's best place kickers. This game was exciting, even to novices of the sport, such as Katherine and I. Many times, the crowd proved to be the most interesting part of the game, as the La Pa supporters really threw themselves behind their team and held nothing back in the support of their "boys." Many of the action sequences in this movie do not play as well as I would like, thanks to the high level of compression. However, at least the movie is a decent size for low bandwidth viewers. Bunda and an unknown La Pa player before halftime. Note the lack of any real padding. Skinned knees and bloody elbows are just part of the game. A Moore Park player is surrounded by La Pa players before being tackled. Play resumes again, with the football being placed on the ground to be passed back to a teammate by using a foot. The game starts to take its toll, with La Pa substitutions becoming increasingly necessary closer to halftime. 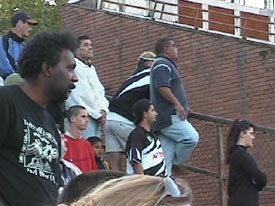 La Pa fans could barely restrain themselves every time a call was made against their team. During most of the game, most of the loudest fans, especially players from previous La Pa teams, stood shoulder-to-shoulder below one of the lights used for night games, straining to make out very movement of the ball. 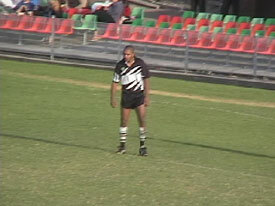 Bunda prepares to catch a kick and run the ball back. A lot of the game is walking around, trying to anticipate where the football is going to go next so that you can be ready to tackle if the action heads your way. 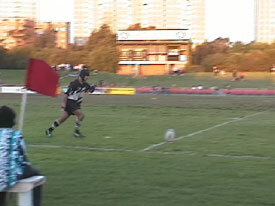 Bunda prepares to catch the pass for the winning try. When scoring the winning try, Bunda had the presence of mind to stick his hand out of the pile and place the ball on the ground, making sure that the refs - and the crowd - could see he was successful. After scoring his try, Bunda's finger goes into the air from the middle of the pile to start the celebration. Bunda and his team celebrate the apparent win. Pumpkin lines up to kick the winning field goal.